Planning your holiday is half the fun of travel. And very important; deciding where to stay on the Gili Islands can make or break your trip. So picking the right area and hotel to call ‘home’ for a few days or more is essential. But no stress, we are here to share our favorite places with you! There are a few various aspects you should look for when choosing your accommodation. You should establish a price range you are willing to pay first. This can make the process a lot easier. Location is something often people forget to look at. Most of the time we assume it’s close to the center of where you want to be, but you should always check on the map where the location of the hotel is before booking. These days there has never been more choice and that can be overwhelming and leave you full of questions. How do you know which place will suit your travel plans and itinerary? To make it a bit easier for you, we will share some of our favorite places on the Gili Islands with you! Would you like to stay completely up to date on what’s happening on The Gilis? Check out our Gili News & Tips page. 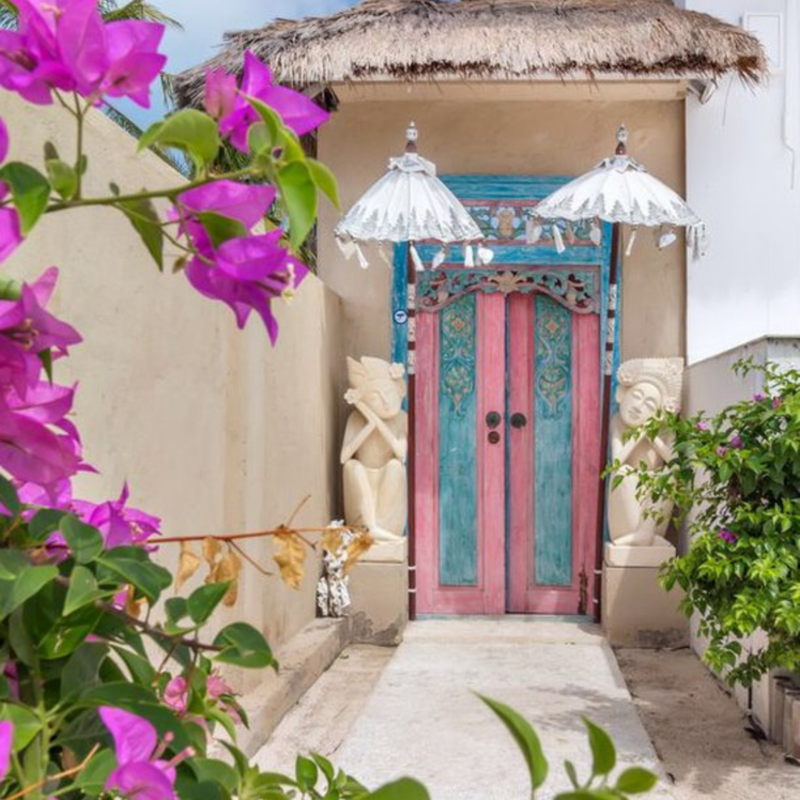 This lovely resort offers exquisite Indian dishes, shisha smoking near the beach and beautifully decorated rooms with handcrafted furniture from Lombok and India! They’re located on the main road of Gili Trawangan. Sit on their rooftop bar for sunrise, it’s worth the early morning wake up for views of Mt Rinjani and our neighboring islands! You’re going to have to pinch yourself to make sure it’s real! If you’re in the mood for a chill night during your stay, they offer movie nights on Mondays and Thursdays at 7 PM for 50,000 IDR with popcorn included! All movies are on a monthly theme and released prior to 2009! 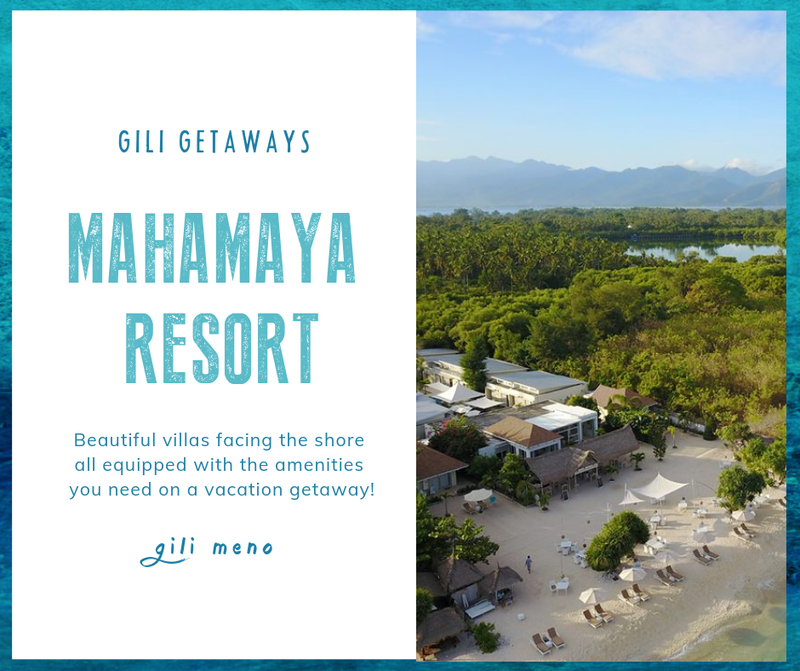 Wake up to the turquoise island waters of Gili Meno in one of Mahamaya’s exclusive beach-facing villas. Each villa features king-sized beds and stylish furnishings. In addition to spectacular sea views and secluded terraces, their villas feature private outdoor showers so you can shower under the stars. All rooms have hot and cold fresh running water, safety deposit boxes and unlimited complimentary drinking water. Enjoy exclusive Indonesian cooking classes with their executive chef, a paddle-out in their sea kayaks, a splash-about in their freshwater pools or a sweat-sesh in their gym! 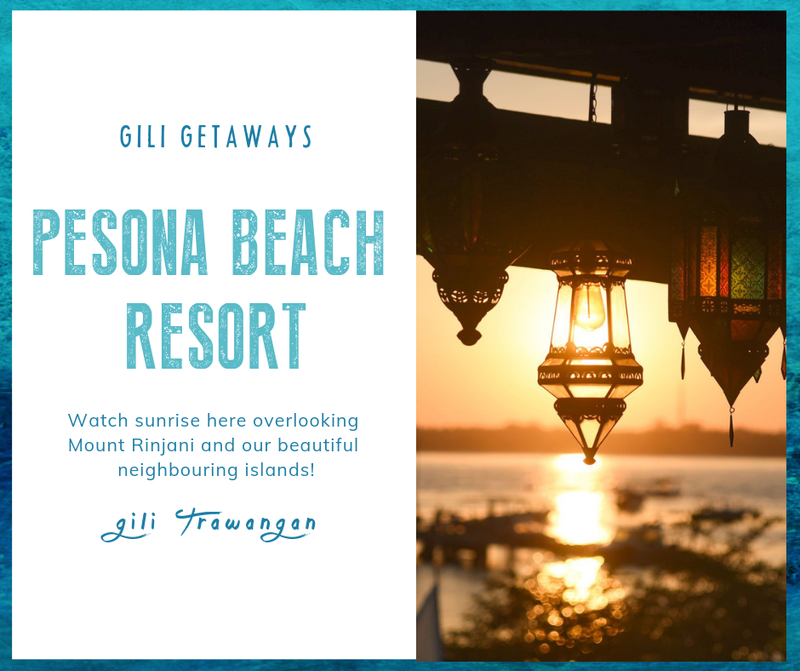 So if you plan on visiting Gili Meno, consider this beautiful getaway as an option! This a wonderful Gili getaway to stay if you’re planning to relax right by the beach. Don’t feel like getting all sandy and salty? They also have a big pool to chill beside. 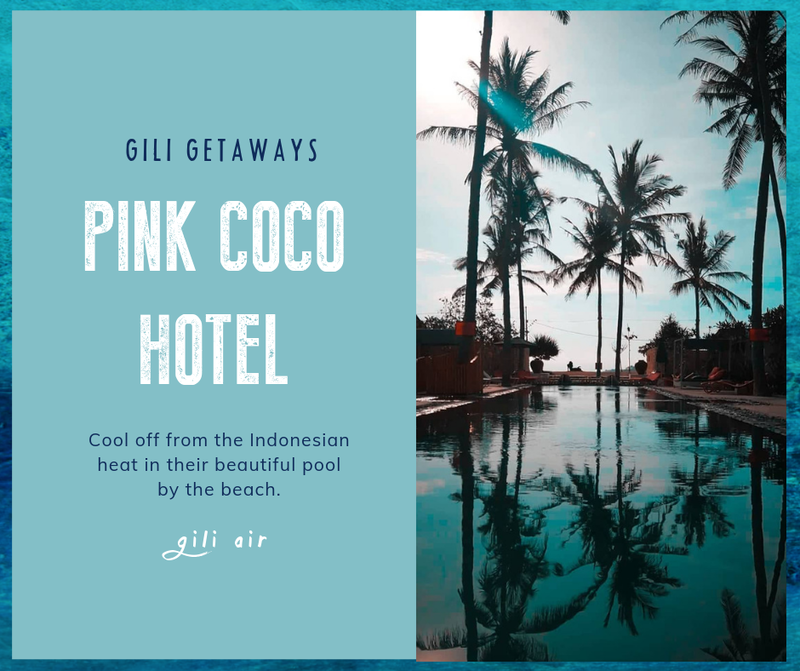 Take your pick between their PinkCoco Gili Trawangan or Gili Air locations! They have a whole range of rooms to stay in, so book your stay if you’re looking for the Pink Coco experience! 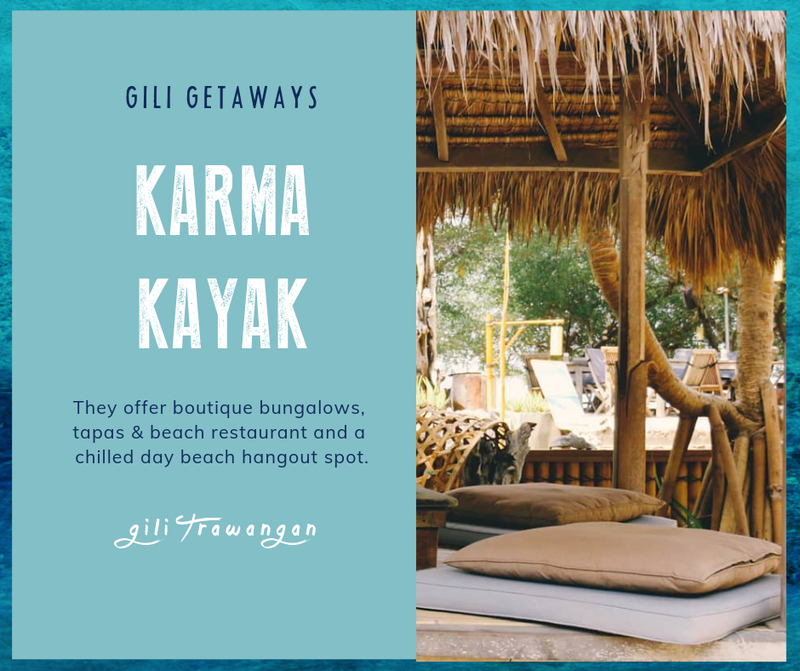 Karma Kayak is is a small boutique resort situated on the northern quiet-side of Gili Trawangan, right in front of the main snorkelling areas. Stick around and catch one of Gili Trawangan’s infamous sunsets from here, it’s worth the site! 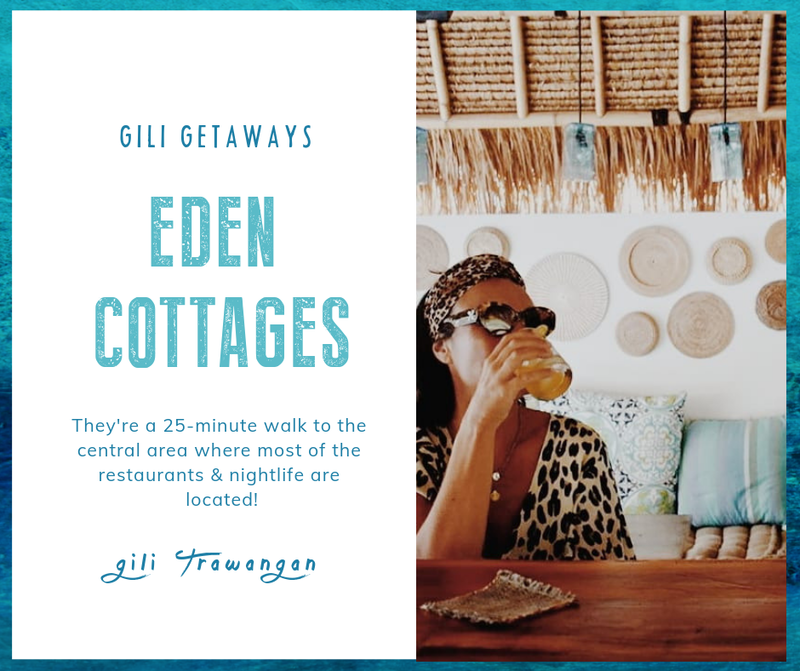 Eden Cottages is located on the quiet north side of Gili Trawangan. There have a small cafe and bar on site with nightly dinner specials! They have a cute vegetable garden and many fruit trees, which is worth the sight! Tip for Families: They have a baby cot/crib available if needed & a kiddie pool for your young ones!